designers and tastemakers has given these time-honored icons new life, introducing all the elegance and amenities one could ever desire. 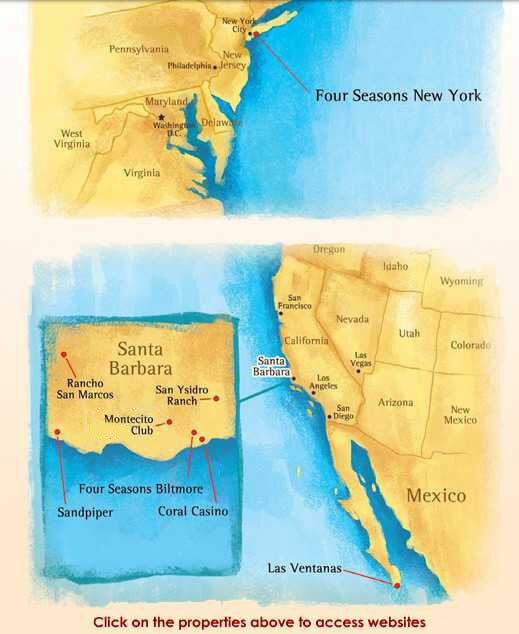 The Connoisseur Club® creates a world of adventure across the whole portfolio of Ty Warner Hotels and Resorts. In California, Mexico and New York, the Connoisseur Club® gives members an exclusive opportunity to experience life the way it should be and so rarely is. The opportunity to enjoy one's leisure in such a setting will never be replicated. Local land and development restrictions adopted since the Clubs' completion preclude the construction of buildings on this grand scale. Connoisseur Club® membership offers an opportunity to experience a standard of luxury and comfort elevated to unprecedented levels in an incomparable environment. For further information, kindly contact my sales office at 805-695-8887 or toll free at 866-870-4888.